This DVD is continuation of a Puppy Diary and shows everything I did with little To from age of 5 months to 18 months, so lots of tricks, beginnings of agility training, cik&cap and all other foundations, teaching weaves and running contacts from zero to final product and shows her first trials and first wins. The DVD plays everywhere in the world and can be shipped anywhere. Because it is 3h 10min long we had to use dual layer DVDs (DVD +R DL) which should play on all computers and DVD players except on some very old ones. I´m thinking about buying this video -- looks really nice! 🙂 But I don´t have the number one -- puppy diary. My dog is over one year old, so she is not a puppy anymore… Do I really need it? 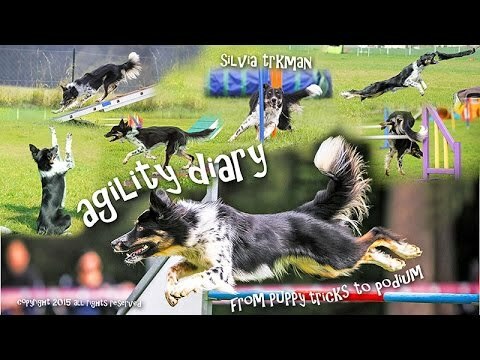 Hi Silvia, toward the end of the Agility Diary you quickly show Tu doing the lifting the alternate legs trick, but in the Diary video you didn’t go into detail the steps to teach it… I am quick scanning the other three tricks videos I have of yours because I’m sure in one of them you do teach it, but I haven’t found it yet. I think Razzle is really ready for this one… which video is it on????? We work on diagonal legs in Advanced Tricks and it’s shown in Agility Diary, showing most of the sessions we had on diagonal legs, from first one on -- it goes really quickly as it’s related to side legs and taught the same way. I’m interested in a number of your videos, do you have any sales coming up? Not really until November… BUt I can always offer “buy 4, get 5” option. Hi I sent an email but not sure if it sent, I clicked the send to myself option and never received it. My question was this. I purchased both puppy and agility diary and my pup is 4 months old. I finished the puppy diary, and started to watch the agility one, but the very first thing I noticed is To had seemed to learn much in between. We are at the level of the ending of puppy diary but I don’t know how to get her to the level of the beginning of the next dvd. This is her tricks video at 3 months. The attached video is her current cik and cap skills and she finishes through a channel weave. I tried to attach a video and it didn’t work so I put them on YouTube. My trainer at our agility foundations class said there was some dvds in between. Can you tell me which ones? Or am I just confused. Thank you!!! There are no DVDs in between and all the months and trainings are followed up normally, we did 2 DVDs just because it would be too long for one. I think your pup is just too young for this work -- you will see I start channel much later. And racing her over the ladder like this is dangerous and not a good idea. -- See I never do cavalettis in more as trot!!! So I would just focus tricks and sends to single cik/cap for now and maybe join February Foundations class to make sure you’re not doing too much with 4 months old puppy. Okay thank you for your honesty. I am very inexperienced so I appreciate your response. Yes, I think a class would be best for inexperienced handler!